A highlight for guests visiting Maine during fall foliage season is our moose watching tours. The next 3 weeks tend to be the most exciting for us guides, too! We have been waiting all season long to see the behemoth bull moose emerge from the forest showcasing his antlers and bull stature. Needless to say, the fall colors in Maine are always a treat and as the backdrop for photographers in search of moose, it couldn't be more exciting! Guests flock to the Moosehead Lake area each fall. A typical getaway for many fall foliage enthusiasts is a tour to Maine's rocky coast to trek along the carriage roads of Acadia National Park. Most will then journey inland to Maine's largest lake and that's where you will find us, the closest moose watching tour company to the Bar Harbor and Acadia region, here at Northeast Whitewater & Guide Service. Travelers enjoy the rugged, woodsy view decorated in oranges, reds, yellows with evergreens pickling the landscape. Once inland, joining our moose tours is an obvious choice to grasp the enormity of the forest and the wildness of the area. 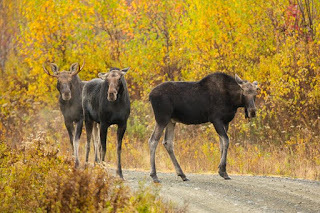 The moose tours are 3-4 hours and an exciting adventure for everyone; young, old, big, small you will love the interpretive journey lead by our Maine guides, exploring the forest, and beauty of this pristine area. From Moosehead Lake, we recommend driving through Maine's mountains that lead to New Hampshire. You'll find that traveling through the mountains of Maine, New Hampshire and Vermont tend to captivate the color changing of the fall foliage season perfectly during a one to two week fall foliage getaway. Plan ahead, though! Many travelers think that since most families and children are back to school, the Northeast must be quiet in September and October. Not true. Mid-September to mid-October are just busy as peak summer, it's no longer family trips, instead couples and overseas travelers are enjoying holiday. Schedule ahead of time, plan your stay and plays and we'll look forward to enjoying the fall colors and moose watching with you. Northeast Whitewater & Guide Service can be reached daily from 7 AM - 9 PM at 207-695-0151 or toll-free at 888-484-3317 or feel free to email us at info@northeastwhitewater.com. I have enjoyed reading your blog. I wish you had some updated posts. My family and I will be traveling to Moosehead Lake in the Spring. I found an article on visiting Greenville https://www.hotelsnearme.co/content/what-do-greenville-maine-and-moosehead-lake but it didnt mention anything about Moose Guide Tours in the Spring. Any information you could share with me about moose watching the spring would be appreciated.